The meat industry in the United States is big business: The vast majority of Americans eat meat, and we eat a lot of it--roughly 200 pounds per person every single year (in animals, that's about 30 chickens, 1 turkey, one-third of a pig, one-tenth of a cow, and dozens of fin fish). And although per capita consumption has fallen in recent years, we're still eating far more than our parents and grandparents--including six times as many chickens per capita as were consumed in the 1930's. 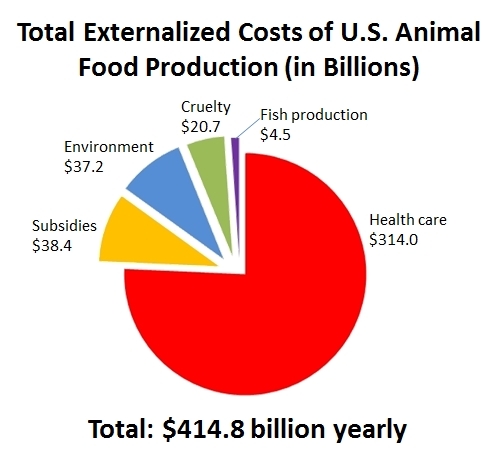 If those costs were incorporated into the price, according to Simon's analysis, animal products would cost almost three times as much as they do today. With the true costs included, consumption levels would plummet. Simon stresses that his figures are conservative: Because his estimates are limited to those supported by published research, he necessarily omitted some costs that have gone unmeasured in the scientific and economic literature. For example, Simon's numbers on health care assign only a fraction of the heart disease tally to meat, even though we know that a low fat vegan diet will reverse the disease for almost everyone who has it. His numbers on the environment look at lost property values due factory farms destroying local environments and carbon offsets, but of course, the external effects of warming are far greater than the value of the offsets, and property values can't capture the fact that these industrial farms destroy communities and ruin lives. Finally, his quantification of the cruelty meted out by these industries discusses just five meat industry abuses--such as cramming pigs and chickens into tiny crates where they never spread their limbs or go outside--and relies on consumer willingness to pay to get rid of them. It's an impressive analysis, based on work published by Oxford University Press and carried out by agricultural economists from Oklahoma State University, but of course these are the sorts of things that defy valuation. The fact that $414 billion is conservative is in no way a problem with the book, of course--the real figures are incalculable, and conservative figures are more than adequate to accomplish Simon's task of explaining that the USDA's promotion of meat, and the lack of inclusion of external costs, mean that Americans consume vastly more of the stuff than we would if we were paying the true costs. Simon's solution comes in three parts: An excise tax on all products that contain animal ingredients, a tax credit for every American (basically giving back most of the tax revenues), and a reformulation of the USDA's mission away from promoting the consumption of animal products to instead promote the public health. Though enacting Simon's proposals will require a steep climb, Simon makes his case persuasively: The meat industry is harming our health, destroying our environment, and abusing billions of animals annually. As he notes in discussing prospects for his plans: "Change does happen, often in swift and surprising ways."